For today's blog challenge we are interviewing a co-worker, Ameya Deshpande. Ameya works as Director of Support for Survey Analytics in Pune, India. The reason behind today's blog challenge is simple. In today's hectic world, sometimes it is nice to slow down and get familiar with the world around you. Getting to know your colleagues and understanding the ins and outs of a co-worker's life is the first step to a tight-knit company, especially if you have employees working all across the world like we do at Survey Analytics. Read on to hear more about the daily life of Ameya and what he enjoys most about his job! 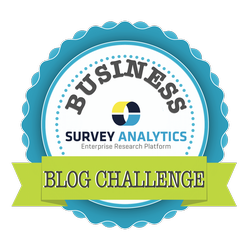 Q1: Give us a short paragraph about your typical day in the life at Survey Analytics. How does a normal day start and end? What happens in between? Having clients that are spread across multiple time zones from Australia, the Middle East, Europe and the US, each day is different. But generally a day begins at 12:00 am PST and ends indefinitely between 9:00 am PST to 2:00pm PST depending upon client queries. Not being JJ means being able to wind the day up a bit early! :-) A day typically begins with emails from clients and ends with checking Yammer and account statuses in Salesforce. Between these two there are things like reviewing email responses by the support team, testing features and options for client requirements, and Skype calls with clients to walk them through things or clarify any doubts. Q2: What do you enjoy most about your job? I really enjoy being able to communicate with clients belonging to totally different cultures having different accents. Most of the time, the requirements of clients are affected by their cultures (and regional traits). Being able to understand these and trying to give clients their specific requirement is a very fulfilling thing. I also like teaching things to the support team members when they are new, and learning things from them, such as different ways of doing things later on when they grow. Q3: What is the biggest challenge you face with your job? Multitasking doesn't come naturally to me. That's probably the only challenge per se. Speaking of multitasking, we recently just saw a very interested TED Talk that questions the efficiency of multitasking. It's an insightful video that's under 3 minutes and discusses the possibility of "monotasking". Check it out here. Q4: What are some insider tips you have for providing great support and service? 1) Understanding and knowing the issue / concern. Many times the users themselves do not know what their real concern is. They may express it in some other words, or in form of some surrounding concern. Understanding exactly what a user is looking to achieve, by asking the right questions, is half of the problem solved. 2) Considering all the possible options. Having understood the requirement, instead of providing the most obvious solution right away, more often than not it makes more sense spending some time in considering all the different options that the system provides before. Many times a smarter option is hiding somewhere. 3) Communication is the key. Q5: Enough about work, what are some things you enjoy outside of work? Working out. Watching episodes of 'Fringe'.